We designed two crochet patterns to share with Ashleigh’s fans. The first one is this little Christmas Tree Kawaii Cuddler. He can be personalized to your heart’s content with colored ornaments and embellishments. Below you will find instructions to crochet your very own Christmas Tree. Enjoy our new free crochet pattern! *Worsted Weight Yarn in green, brown, and yellow. Round 2 – ch1, DC into next st, ch2, SC into side loop of 2nd chain and DC (See picture), sl st into next stitch in MR. This will make one point on the star. Repeat four more times to create five points. Sl st into last st of MR.
* Place safety eyes between rows 5 & 6 from the bottom of Christmas Tree body (not including the trunk) roughly 12 stitches apart. 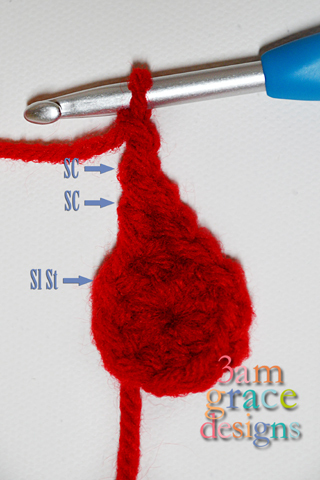 * Sew or glue ornaments in desired locations. * Align Christmas Tree halves so ends of rows match. With wrong sides facing each other, single crochet around both pieces to join together. If you want your edging to match – make sure you change colors as you SC around. Stuff with Poly-Fil prior to completing stitching. Make sure you work in a counter-clockwise direction so your stitches face forward. * Sew or glue star in place, making sure the front and back stars line up correctly. Glue or sew the bottom two points to the tree. Whipstitch around the top three points, stuffing with Poly-Fil prior to completing stitching. We’re so glad you like it, Amy! We’d love to see it when it’s complete! Hi Becky! That is so sweet to hear! You are very welcome. We’re so happy you’re enjoying our patterns.